Short-Period Ocean Bottom Seismometers detect vibrations from small earthquakes ranging from 0.1 Hz to 100 Hz. These earthquakes are caused by local phenomena, such as melt movement beneath volcanoes and upward flow of hydrothermal fluids in the conduits that feed black smoker chimneys. 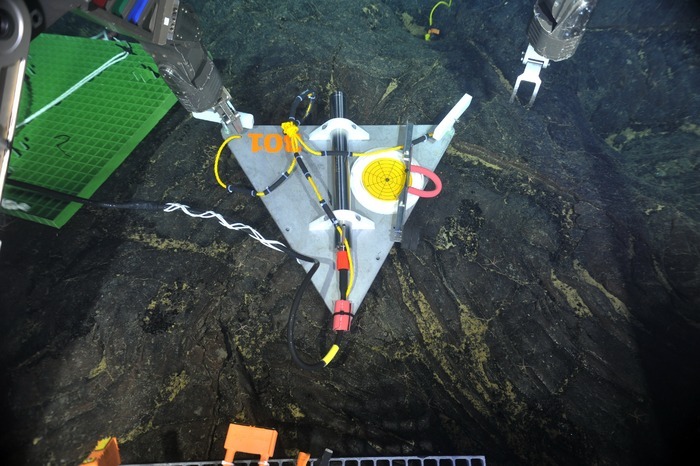 These instruments enable imaging of the seismic energy traveling through the seafloor. All instruments are streaming data live to IRIS (Incorporated Research Institutions for Seismology), and are available to the public. Daily and hourly updates on the number of earthquakes occurring at Axial Seamount can be accessed through Dr. William Wilcock’s website, one of several Community Tools that users have created. A short-period seismometer deployed on a flat sheet flow ~1.3 km east of the ASHES hydrothermal field at Axial volcano. The black ball in the yellow circle shows that it is perfectly level. Photo credit: NSF-OOI/UW/CSSF.